(Sarasota, FL) One of the early screenings in the 13th Annual Sarasota Film Festival, which began last Friday, is a documentary about three pioneering female war correspondents who covered World War II. In the film “No Job for a Woman”, the stories of three of those pioneers, Dickey Chapelle, Ruth Cowan and Martha Gellhorn are eloquently told through vintage film clips, photographs and actor recreations of the actual words of those women. While today’s news audiences are accustomed to seeing women reporters, correspondents and anchors covering just about every type of story in both broadcast and print media, that was not the case during World War II when a handful of female news correspondents, as the film points out, were relegated to handling the “Four F’s” (fashion, food, furniture and family”) for either women’s magazines or a newspaper’s feature section. Martha Gellhorn, who was married to Ernest Hemingway, was a correspondent for “Colliers Weekly”, a popular magazine at that time. She covered the Spanish Civil War in the late 1930’s and eventually reported on the rise of Hitler in Germany. When World War II broke out, Martha Gellhorn applied for credentials to be a wartime correspondent. As film director Michele Midori Fillion depicts, Mrs. Gellhorn, along with Ruth Cowan and photographer Dickey Chapelle consistently ran into roadblocks in getting credentialed as war correspondents. Ms. Fillion’s outstanding use of vintage photographs and film of World War II and having three actresses portray Chapelle, Gellhorn and Cowan in vignettes telling of their experiences, does a magnificent job of involving the audience in these courageous women’s lives. Actress Julianna Margulies provides just the right tone throughout the documentary as the film’s narrator. 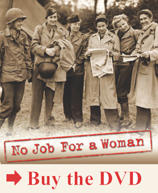 Running just over an hour, “No Job for a Woman” captures the essence of what it was like for not only a woman, but any war correspondent having the task of writing about the horrors of battle. It almost ends too soon just when you get to know these three pioneering journalists. According to the film’s producer Maria Agui Carter, who spoke after the screening on Sunday in Sarasota’s Hollywood 20 Cinemas, the film took more than 10 years to make from inception to actual production. Plans are for eventual airing on PBS and possible DVD release. The film website is www.nojobforawoman.com.